Catch Up® Accredited Trainers have to catch up too! That’s why we hold an annual conference just for our trainers. What do we do at these conferences (apart from enjoying a get-together with trainers working as far apart as South-West England, Wales and Scotland)? Well, we update ourselves on all the latest initiatives in education and review any minor modifications made to the Catch Up® Training package. So what’s new? This year we have added some great new video clips to enhance our training (particularly for numeracy). We also heard how our latest research projects (EEF funded) are progressing. The Trainer conference is an excellent opportunity to address any queries that come into the Catch Up® office. Typical questions we discussed were about the best way to teach long vowel sounds and also about the effectiveness of Catch Up® with learners with dyslexia. Of course, with new curricula in England, Scotland, Wales and Northern Ireland it’s important that Catch Up® trainers are aware of how changes in the new curricula will impact on special needs children and also how best to target funding associated with eligibility for free school meals. Finally, our conference gives us the chance to look ahead and share our plans for Catch Up® in the future. Catch Up® is going from strength to strength and our conference is a great way to celebrate that success but also to remind us of the challenges ahead. 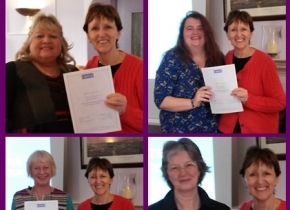 We also gave out a few more certificates to our accredited trainers - see the evidence below!